A/Vaux Lattis switchers for Hi-Def Component Video are available in either standard (75-ohm phono-jack output) or CAT-5 versions. A/Vaux CAT-5 switchers use 8-position modular output jacks, for connection using standard CAT-5 patch cables and in-wall wiring. Our CAT-5 component switchers are also available with or without Digital Audio capability. Available in the same 6x8, 12x8, and 12x16 switching sizes, our standard component switchers have an LE- prefix, while our CAT-5 versions are denoted with a CT- prefix. Lattis component video switchers handle Hi-Def 1080i and 720p formats, as well as Progressive-Scan 480p signals, and Std-Def 480i. Note that the resolution of component video is dependent on the source signal, and that the HDTV monitor adapts to the resolution of the source. 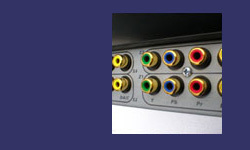 Lattis Hi-Def Component-Video units may be combined with any of our other switchers for various signal routing needs. When combined with our stereo audio switchers, RS-232/Ethernet control provides commands for switching audio/video sources together, or breakaway control for audio-only or video-only switching. In addition to RS-232 or Ethernet ascii commands, all Lattis switchers may be controlled using infrared commands from an A/Vaux remote control or IR-learning remote or keypad. Lattis LE-608HD, LE-1208HD, and LE-1216HD systems switch Hi-Definition Component Video signals, to eight or sixteen HDTV monitors up to 250 feet away, using triple-coax cabling. The Lattis LE-808AHD switcher combines a 6x8 Hi-Definition Component Video section with an 8x8 stereo audio section; the A/V sections may be controlled together or independently. Lattis CT-608HD, CT-1208HD, and CT-1216HD systems switch Hi-Definition Component Video signals, to eight or sixteen HDTV monitors up to 500 feet away, using CAT-5 cabling. These switchers (note the HD suffix) provide the component signal and room receiver power on a single CAT-5 cable to the distant monitor. Use model CT-HDRX receiver modules with these switchers. Lattis model CT-808AHD switchers combine a 6x8 CAT-5 Component Video section with an 8x8 stereo audio section. The A/V sections may be controlled together or independently. © 2013 a/vaux electronics, inc.